Henry Anderson (1807-1861) Family History Collection, c. 1860. Sullivan County Manuscript Collection 0020. The collection was donated by Harold W. Barr [366 Barr Rd., Blountville, Tennessee] to the Archives and History Division, Sullivan County Department of Archives and Tourism in March 2006. Henry Anderson (1807-1861) Family History Collection. MSS 0020, Archives and History Division, Sullivan County Department of Archives and Tourism, Blountville, Tennessee. The Henry Anderson Family History Collection was penned by Henry Anderson (1807-1861) of Sullivan County, Tennessee. [Henry Anderson was the great-grandfather of Mrs. Harold Wayne Barr, one of the donors of this collection.] Henry Anderson was the son of John Anderson, son of William Anderson of Sullivan County. 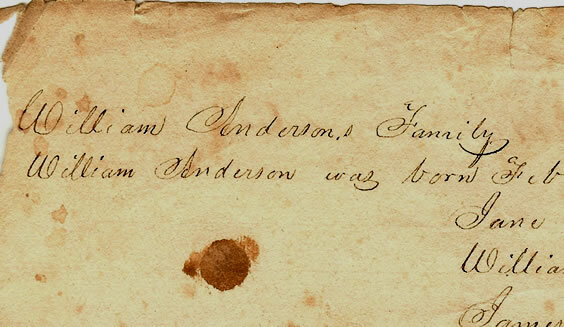 Henry Anderson penned the chronology of William Anderson (born 1736) family and descendants in Sullivan County, Tennessee as well as certain obituaries pertinent to a few of the descendants. The original booklet consisted of several small pages sewn together in the center, and the booklet contained 18 pages of handwritten entries that were scanned by Shelia Hunt. In addition to the children and descendants of William Anderson, it is noteworthy to mention that the pages include genealogical data on Hugh and Hannah Anderson Crawford family; John and Rachel Anderson family; Henry and Nancy M. Anderson’s family; and the George W. Spurgin [Spurgeon] family. The pages include obituaries of Sarah Annis Smith, who died in 1851; Samuel Anderson, who died in 1849; Mrs. Jane Anderson who died circa 1852; Mrs. Isabella Hughes, who died in 1854; Sarah G. Anderson; Mrs. Nancy Ruth Anderson, who died in 1850; Willie McClellan, who died in 1859; Nannie McClellan, who died at age 10; Maria A. Anderson, who died in 1854; Mrs. Isabella Holt, who died in 1852; Nancy Elizabeth Crawford, who died at age 20; Mrs. Sarah E. Wilson, who died in 1849; John Fain, who died in 1852. The death of Nicholas Fain is also mentioned. Harold Wayne Barr was born 9 April 1926 in Kern County, California to Clarence William Barr, Sr. (1890-1959) and Mellye Frances Foust (1888-1983), both of whom were from Sullivan County, Tennessee. Harold Wayne Barr married on 17 August 1957 to Sara Rebecca Anderson (born 13 June 1929), daughter of Thomas Bruce Anderson (1889-1970) and Laura Celestine Akard (1891-1987). Thomas Bruce Anderson was the son of John Reuben Anderson (1846-1895) and Rebecca A. Lessley (1844-1925), all of Sullivan County, Tennessee. John Reuben Anderson was the son of Henry Anderson (1807-1861) and his first wife, Nancy McMahan Fain (1813-1850). Henry Anderson, aforementioned was the subject who penned the Anderson chronology. Henry Anderson (1807-1861) was the son of John Anderson (1765-1850) and Rachel Roberts (1775-1831) of Sullivan County, Tennessee. Henry Anderson married twice, and both his wives were named Nancy Fain. He married (1) Nancy McMahan Fain (1813-1850), daughter of John Reuben Fain and Eleanor Crawford, and he married (2) Nancy Ruth Fain (1824-1859). Henry was a surveyor in Sullivan County, and he left much genealogical information about his father and siblings. Henry’s father, John Anderson, was also a surveyor in Sullivan County. Henry Anderson’s chronology of the Anderson family was passed down to his son, John Reuben Anderson (1846-1895) who married Rebecca A. Lessley [Lesley] (1844-1925). John Reuben Anderson and his wife resided on Bancroft Chapel Road near Kingsport in Sullivan County, Tennessee. John Reuben Anderson died of typhoid in 1895, and the Henry Anderson papers were inherited by John Reuben Anderson’s son, Thomas Bruce Anderson (1889-1970), who married Laura Celestine Akard (1891-1897). Thomas and Laura Akard Anderson had one daughter, Sara Rebecca Anderson (born 1929) who married Harold Wayne Barr (born 1926). Circa 1970, Henry’s papers were found in the former John Reuben Anderson’s home on Bancroft Chapel Road. As of March 8, 2006, the original copy of the Henry Anderson chronology is in the possession of Harold and Sara Anderson Barr of 366 Barr Road, Blountville, Tennessee 37617. Harold and Sara Anderson Barr graciously allowed Shelia Hunt of the Sullivan County Archives to scan the original booklet. 1. Henry Anderson Chronology of William Anderson (born 1736) Family and Descendants. [Copies of scanned images of 18 pages contained in the original Henry Anderson chronology].